Professional development - what is it? Professional development refers to skills and knowledge attained for both personal and career advancement. Professional development encompasses all types of facilitated learning opportunities, ranging from college degrees to formal coursework, conferences and informal opportunities situated in practice. It has been described as intensive and collaborative, ideally incorporating an evaluative stage There are a variety of approaches to professional development, including consultation, coaching, lesson study, mentoring, reflective supervision and technical assistance. It is the subject of much debate and is difficult to get the balance just right. Is it something you do at a particular time in a particular place? Is it something that you can do on your own? Can you do it at home? Can you count reading a blog from someone you admire as PD? I do. I read many blogs and articles on the internet and it is where I get most of my new teaching ideas. Andrew Churches from Kristin School on the North Shore is someone I admire and whose work on his blog is always interesting and thought provoking. I've heard him speak about technology in schools and he is marvellous. He and I were nominated as Microsoft Distinguished Teachers here in NZ a few years ago. Neither of us won but he sure should have. His interest and involvement in ICT is impressive and he is someone whose presentation at a Conference I would not miss. 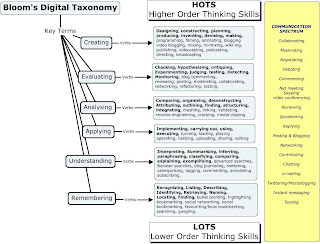 I have recently used his Blooms Digital Taxonomy which has been very useful for planning tasks for students. I have found reading his stuff on this taxonomy excellent PD. The highest order tasks "creating" are some of the hardest to do especially when you are teaching students in their last year of school. In many ways, these students are reluctant to do things like this, as they think it is a waste of time when they should be learning things "off by heart" for their exams. I continue to perserve however. 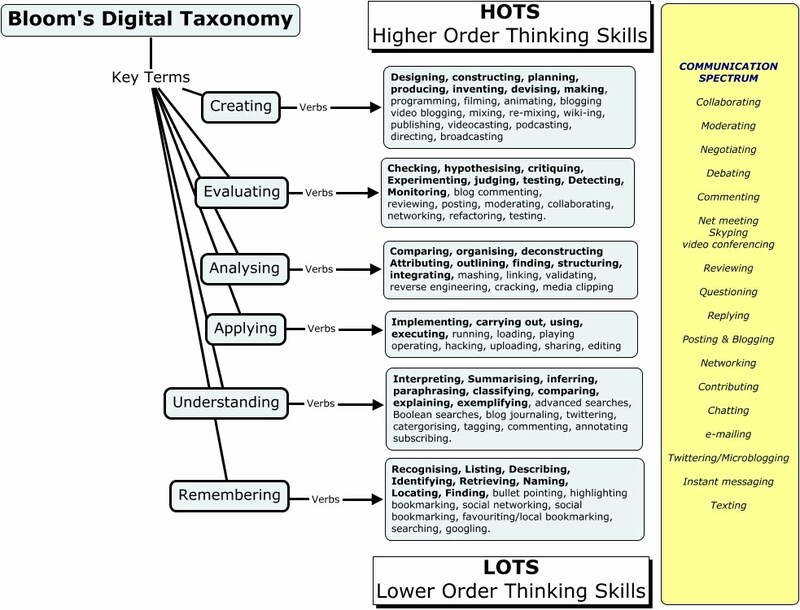 Here is some information taken directly (with some deletions as I am applying it to my classroom and those in my faculty) from Andrew's site on the taxonomy - I am really interested and hope to get my students beyond the simple lower order thinking skills to the HOTS. This element of the taxonomy does infer the retrieval of material. This is a key element given the growth in knowledge and information. Bullet pointing – This is analogous to listing but in a digital format. Highlighting – This is a key element of most productivity suites; encouraging students to pick out and highlight key words and phrases is a technique for recall. Bookmarking or favorite-ing – this is where the students mark for later use web sites, resources and files. Students can then organise these. Social networking – this is where people develop networks of friends and associates. It forges and creates links between different people. Like social bookmarks (see below) a social network can form a key element of collaborating and networking. Social bookmarking – this is an online version of local bookmarking or favorites, It is more advanced because you can draw on others' bookmarks and tags. While higher order thinking skills like collaborating and sharing, can and do make use of these skills, this is its simplest form - a simple list of sites saved to an online format rather than locally to the machine. Searching or "Googling" - Search engines are now key elements of students' research. At its simplest the student is just entering a key word or phrase into the basic entry pane of the search engine. This skill does not refine the search beyond the key word or term. Recognizing, listing, describing, identifying, retrieving, naming, locating, finding, Bullet pointing, highlighting, bookmarking, social networking, Social bookmarking, favorite-ing/local bookmarking, Searching, Googling. Advanced and Boolean Searching – This is a progression from the previous category. Students require a greater depth of understanding to be able to create, modify and refine searches to suit their search needs. Blog Journaling – This is the simplest of the uses for a blog, where a student simply "talks" "writes" or "types" a daily- or task-specific journal. This shows a basic understanding of the activity reported upon. The blog can be used to develop higher level thinking when used for discussion and collaboration. Twittering – The Twitter site's fundamental question is "what are you doing?" This can be, in its most simplistic form, a one or two word answer, but when developed this is a tool that lends itself to developing understanding and potentially starting collaboration. Categorizing – digital classification - organizing and classifying files, web sites and materials using folders etc. Commenting and annotating – a variety of tools exist that allow the user to comment and annotate on web pages, .pdf files and other documents. The user is developing understanding by simply commenting on the pages. This is analogous with writing notes on hand outs, but is potentially more powerful as you can link and index these. Subscribing – Subscription takes bookmarking in its various forms and simplistic reading one level further. The act of subscription by itself does not show or develop understanding but often the process of reading and revisiting the subscribed-to feeds leads to greater understanding. Interpreting, Summarizing, inferring, paraphrasing, classifying, comparing, explaining, exemplifying, Advanced searching, Boolean searching, blog journaling, twittering, categorising and tagging, commenting, annotating, subscribing. Playing – The increasing emergence of games as a mode of education leads to the inclusion of this term in the list. Students who successfully play or operate a game are showing understanding of process and task and application of skills. Uploading and Sharing - uploading materials to websites and the sharing of materials via sites like flickr etc. This is a simple form of collaboration, a higher order thinking skill. Editing – With most media, editing is a process or a procedure that the editor employs. Implementing, carrying out, using, executing, running, loading, playing, operating, uploading, sharing, editing. Linking – this is establishing and building links within and outside of documents and web pages. Validating – With the wealth of information available to students combined with the lack of authentication of data, students of today and tomorrow must be able to validate the veracity of their information sources. To do this they must be able to analyse the data sources and make judgements based on these. Tagging – This is organising, structuring and attributing online data, meta-tagging web pages etc. Students need to be able understand and analyse the content of the pages to be able to tag it. Comparing, organising, deconstructing, Attributing, outlining, finding, structuring, integrating, Mashing, linking, reverse-engineering, cracking, mind-mapping, validating, tagging. Blog/vlog commenting and reflecting – Constructive criticism and reflective practice are often facilitated by the use of blogs and video blogs. Students commenting and replying to postings have to evaluate the material in context and reply. Posting – posting comments to blogs, discussion boards, threaded discussions. These are increasingly common elements of students' daily practice. Good postings like good comments, are not simple one-line answers but rather are structured and constructed to evaluate the topic or concept. Moderating – This is high level evaluation; the moderator must be able to evaluate a posting or comment from a variety of perspectives, assessing its worth, value and appropriateness. Checking, hypothesising, critiquing, experimenting, judging, testing, detecting, monitoring, (Blog/vlog) commenting, reviewing, posting, moderating, collaborating, networking, reflecting, (Alpha & beta) testing. Programming – Whether it is creating their own applications, programming macros or developing games or multimedia applications within structured environments, students are routinely creating their own programs to suit their needs and goals. Filming, animating, videocasting, podcasting, mixing and remixing – these relate to the increasing availability of multimedia and multimedia editing tools. Students frequently capture, create, mix and remix content to produce unique products. Directing and producing – to directing or producing a product, performance or production is a highly creative process. It requires the student to have vision, understand the components and meld these into a coherent product. Publishing – whether via the web or from home computers, publishing in text, media or digital formats is increasing. Again this requires a huge overview of not only the content being published, but the process and product. Related to this concept are also Video blogging – the production of video blogs, blogging and also wiki-ing - creating, adding to and modify content in wikis. designing, constructing, planning, producing, inventing, devising, making, programming, filming, animating, Blogging, Video blogging, mixing, remixing, wiki-ing, publishing, videocasting, podcasting, directing/producing, creating or building mash ups.